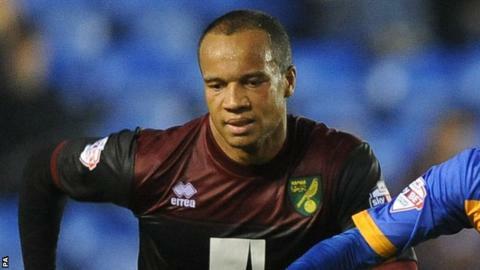 Norwich midfielder Vadis Odjidja-Ofoe is expected to be out for a prolonged spell after suffered medial knee ligament damage. The 25-year-old summer signing came off at half-time in Saturday's 0-0 draw at Sheffield Wednesday, in what was his first league start of the season. Norwich have yet to decide whether he will require surgery. "He's going to be out for a good few weeks unfortunately," boss Neil Adams told BBC Radio Norfolk. "The player has made his first league start and five minutes into the game he has gone and damaged his medial ligament. Odjidja-Ofoe, who arrived from Club Brugge in August, joins creative midfielder Wes Hoolahan on the sidelines after the Irishman damaged ankle ligaments.